Within the next couple of months the Hotham History Project is hoping to publish the first volume in its continuing series of small monographs on the history of North and West Melbourne. Appropriately, this first volume charts the history of the Benevolent Asylum, the first permanent building in the area. Opened in 1851 on a ten-acre site in rolling green countryside, later to be bound by Abbotsford, Elm, Curzon and Miller Streets, it grew into a massive complex of three-story buildings, housing come 700 souls, which dominated the North and West Melbourne skyline until its demolition in 1911. In that year it moved to Cheltenham where it still exists today as the Kingston Centre, part of the Southern Health Care Network. Over the sixty years of its existence in North Melbourne some 14,800 people were helped by the Victoria Benevolent Society. The objectives of the society, formed in 1848, were to ‘relieve the aged, infirm, disabled or destitute of all creeds and nations and to minister to them the comforts of religion’. Many needed assistance only for a short time, others spent many years of their lives in the Asylum. In the early years ages ranged from the very young to the very old. In the immediate aftermath of the population explosion triggered by the gold rushes it acted as an orphanage, lying-in hospital, blind and lunatic asylum. In the first twenty years of its existence, four large wings were added to the original building, which formed a dominate and impressive presence at the end of Victoria Street at its T junction with Curzon Street. In reality however, the three-story design was totally inappropriate for many elderly and infirm residents in the Asylum, especially in its later years. Within twenty-five years of its establishment, there were calls for its removal to a larger and more appropriate site in a country setting, although thirty-five years before this was finally accomplished. The relationship between the Asylum and the local neighbourhood was often tense. The Hotham Council continually agitated for the Asylum’s removal and it was claimed that the excessive level of mortality in the area was caused by the deplorable state of the institution’s drainage. Despite such concerns, both the Management Committee of the Society and the Government continued to procrastinate. Finally in 1904, a special meeting of subscribers of the Society voted almost unanimously to move the Asylum. The Committee chose the site at Cheltenham which had been reserved by the Government many years earlier. The new building was constructed between 1909 and 1911 and in March 1911 the inmates were moved from North Melbourne to their new home. The buildings at North Melbourne were auctioned and removed by Whelan the Wrecker later that year. The hillside Asylum site was leveled so that the gradient would not be too steep when Victoria Street was extended and the land was subdivided and put up for auction in 1913. 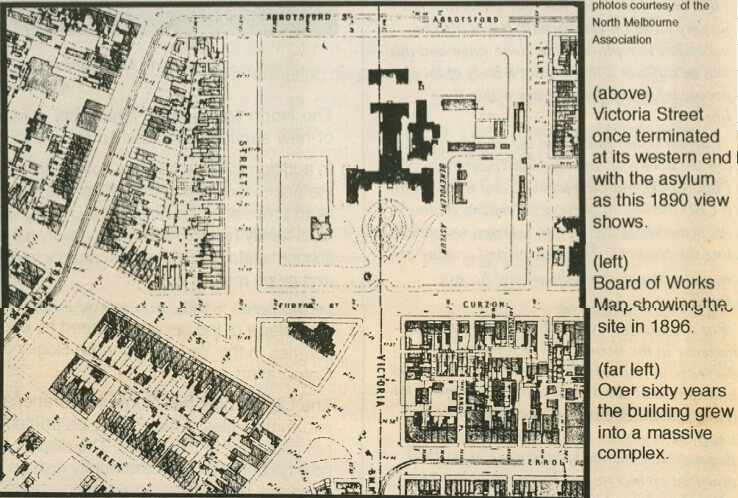 North and West Melbourne began its existence in the shadow of the Benevolent Asylum. They grew together, the Asylum from a small cluster of buildings surrounded by a three-rail fence set amidst a motley collection of tents, and the timber and galvanized iron buildings which constituted North Melbourne in the early 1850’s. By the turn of the century it was a huge fenced and walled compound of buildings located in the most densely populated suburb of Melbourne. 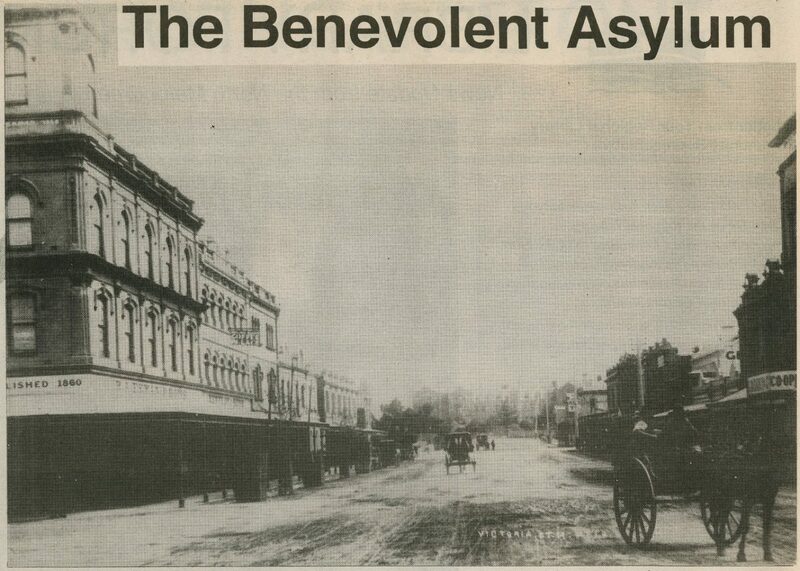 It seems a shame that today, many local residents have never heard of the Benevolent Asylum. by Mary Kehoe, member of the Hotham History Project, March 1998.